Tokata Iron Eyes, 14-year-old Dakota, is among youths who first brought attention to Dakota Access Pipeline threatening Standing Rock. "We are the new generation." "We are going to change the world." "The only enemy that we have is ignorance." "No one knows what they are doing right now, because they will hide it from us." LaDonna BraveBull Allard. "We must empower ourselves. We have a right to live." "It is about the right of our Mother Earth. It is about the Spirit of the Water." "What is happening is ethnic cleansing." Michelle Cook, Dine' "We have all been lied to." "We are not going to be lied to anymore." "We are using and abusing the land." -- Kandi Mosset, Hidatsa, Mandan, Arikara, urging alternative energy. Corporations are not providing the alternatives the people are demanding. 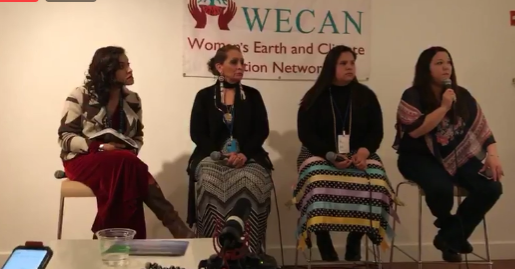 Mirian Cisneros (President of the Kichwa Pueblo of Sarayaku, Ecuador) "This struggle is about the women." "Those who began the struggle are no longer with us, but their spirits are with us." Mirian is speaking of the transnational companies, the extraction, oil, mining, and logging, endangering the Amazon. Thilmeeza Hussain (Former Deputy Ambassador to the UN from the Maldives; WECAN Advisory Council Member; Founder of Voice of Women, Maldives) She describes how climate change is impacting her island. "It is climate genocide." Gloria Ushigua (Sápara; President of the Association of Sápara Women, Ecuador) Gloria said she is not afraid to fight Ecuador. Her people are being killed quietly in the Amazon.